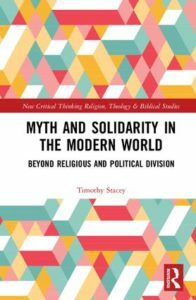 Available for pre-order from Routledge: Myth and Solidarity in the Modern World: Beyond Religious and Political Division, by Timothy Stacey. In the context of the rise of reactionary politics across the globe, this book seeks new ways of developing solidarity across religious, political and economic differences. Drawing on an increasingly influential Christian theological movement,　postliberalism, it claims that the dominance of liberal, secular rationality has blinded people to the fundamental role of transcendence and myth in developing solidarity. The result is either atrophy, or a retrenching in divisive myths of faith, race, nation or economic status. Liberalism is now a dominant force across the globe. But its resonance in the Anglo-Saxon West, from which it originates and has been most fully realized, is relatively underexplored. The book thus follows two simultaneous lines of enquiry. Firstly, a genealogical study of social scientific and policy iterations of the relationship between belief and solidarity in the Anglo-Saxon West, placing postliberal theory into dialogue with the sociology and anthropology of religion, politics and economics. Secondly, it draws from original ethnographic research with groups in London, UK, that seek to develop solidarity in the face of deep-seated difference. By bringing a new way of framing these contentious debates about contemporary society, this research offers tools for more productive conversations around religious and political topics, in particular concluding with a clear policy proposal. It is, therefore, a useful resource for both academics of　theology and　religious　studies,　political philosophy, sociology and anthropology; and for politicians, policy makers and practitioners hoping to develop solidarity in the modern world.